Tired of wasting time and money repeatedly repairing or replacing your cedar or other wooden patio furniture? 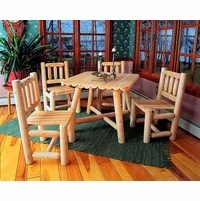 Our online catalog selection of natural cedar wood furniture products gives you plenty of cedar furniture choices that that are safe, affordable and attractive. Thanks to the natural properties of cedar wood furniture, these pieces will endure years of use with little or no maintenance. 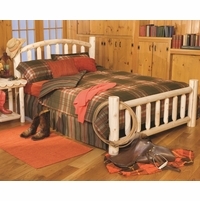 Most of our wood products at CedarwoodFurniture.com are crafted in the U.S. by experienced craftsmen. No imported furniture products from the Orient. As a family-owned company, we at Adams All Natural Cedar care about our customers. We pride ourselves on our outstanding service and our expert knowledge, and we are here to help you. So order from us with confidence. After all, your satisfaction is the heart of our business. The Adams All Natural Cedar team. 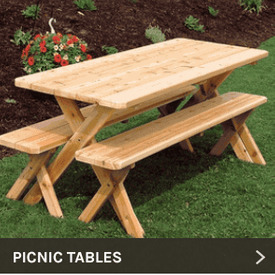 You'll enjoy having your choice of our all-natural cedar or durable cypress wood outdoor patio furniture. Some of these pieces are available as unfinished furniture, while other selections are prefinished outdoor furniture. 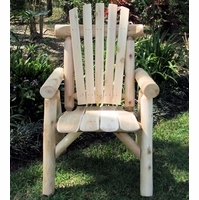 These include handcrafted wood patio furniture, wood lawn furniture, garden furniture and cabin and cottage furniture. We also offer outdoor storage benches and garden structures. Plus, to keep your furniture looking new and extend its life, we sell premium DuPont Patio Furniture covers that offer superb outdoor weather protection in all climates. 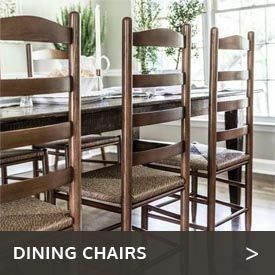 Quality Danove products are featured among our other fine furniture craftsmen. 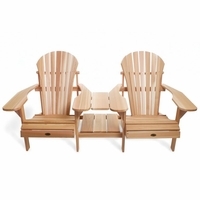 Besides the ever-popular classic Adirondack chairs with ottoman stool and safe kid Adirondack chair, we also carry a folding Adirondack chair and other Adirondack furniture to complement Adirondack chairs. 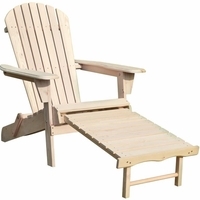 Our folding Adirondack chair packs conveniently for traveling to your cottage for beach-house furniture or just for picnicking or camping. When you’re not using it off-season, store this compact, space-saving chair in your shed. 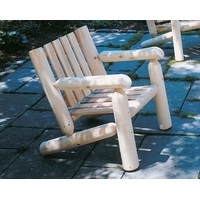 Our cedar outdoor furniture collection can supply all your cedar wood outdoor furniture needs. We have open-slat cedar wood deck chairs and cedar wood chaise loungers that are comfy and cool outdoors by the pool. 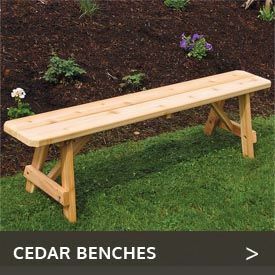 A cedar garden bench is lovely in the yard or for your patio deck. 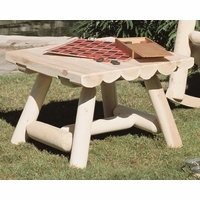 In fact, our cedar patio furniture can upgrade your patio from the ordinary to the extraordinary. Browse our wide selection of lawn garden swings, including our popular mission-style cedar wooden porch swing and canopy yard swing. You'll enjoy the smooth rhythm of their rocking and their comfortable open-slat design for cool relaxation. Our cedar wooden porch swings, glider chairs and canopy garden swing gliders are great outdoor furniture additions in your yard, on the porch and patio. Our handcrafted Western Red Cedar wood doghouses protect your pet from fleas and ticks naturally. They also provide your dog with a warmer doghouse in winter and cooler environment in summer. No painting or maintenance is required. We also carry a unique cedar cat/doghouse duplex: One side of the doghouse is partitioned for your small dog and the other side for your cat. Optional add-ons include insulation and self-closing automatic dog doors, which protect from rain and should be used with our combo doghouse air conditioner/heater units. The heater warms your dog in cold weather, while the air conditioner cools your dog in hot weather. Handle messy gardening chores and transplanting with a handcrafted genuine cedar wood potter’s bench, cedar wood potting table, gardening bench or mini outdoor garden potting shed. Our lockable yard outdoor shed, garden storage shed and patio storage benches are built from weather-resistant cedar wood for use outdoors on the patio. 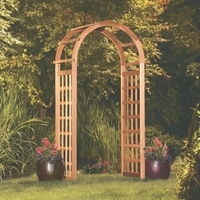 We have a huge selection of the finest Western red cedar wood garden arbors with lattice arbor gate. Check out our sale prices for your best deals. 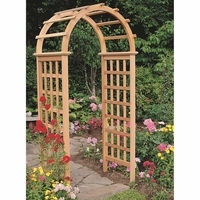 Just a few examples include a beautiful, stately cedar wood New England deluxe arbor, arched rose arbors with trellis and a rustic log arbor. 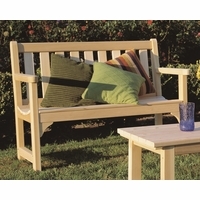 Cedar wooden patio arbors with a bench seat provide relaxation in the garden. 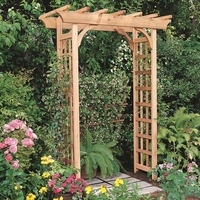 Our adjustable cedar pergola arbor begins at 3 feet wide and goes up to our longest 14-foot classic pergola arbor kit. 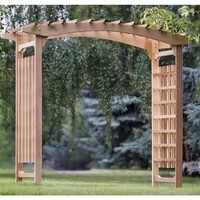 A natural unfinished arbor kit provides secluded outdoor dining in the outdoors for many years to come. In addition to the best cedar wood outdoor furniture, we carry a wide array of other outdoor products to beautify your yard. Our new, stackable modular aromatic cedar wood closet storage system includes a cedar clothes drawer organizer, cubby cubicle, shoe rack and wood closet shelving units. Use this smartly designed system for rack storage in your closet, basement, porch or garage for all your closet needs and to get organized. This beautiful storage system is compatible with California closet systems.